Adelante is a Spanish adverb that means movement and is commonly used to express two ideas: “salir adelante” and “sacar adelante”. These two sayings encourage the development of self and overcoming of obstacles. They are often used to push a person’s development. As such, we believe that the task of evolution of self and overcoming of challenges is vital to the pulse of our community. In order for ALL students to be able to meet the high expectations that ARISE High School holds, a thorough system of support is critical. While our entire school is designed in such a way as to make the educational experience highly personalized, attentive, and responsive, Adelante Student Support Services is both structure and philosophy at ARISE to provide intensive support towards helping students move forward. While there are systems and programs that exist within the Adelante canopy, Adelante itself cannot be reduced to a process or policy. As such, Adelante works within the whole school community to create the conditions, procedures, and resources to support struggling students academically & socio-emotionally using these approaches: Personalization, Response to Intervention (RTI), and Restorative Praxis. The following sections contain the practices and structures within Adelante Student Services. Our presence in the school, as mentors, elders, educators, and advocates sets the culture and tone of the space. The way we carry ourselves and how we interact with students both inside and outside our classrooms communicates expectations. We are all responsible for holding the school up. Here are some ways we expect our professional community to model community accountability and responsibility. Greet students at your door prior to them entering class. This includes the students in your class and students near your entrance. Acknowledge the presence of students and introduce yourself. Even if you don’t teach a child you should build with them. Walk students out of class – prepare to greet your next class. As a shared space hallways are everyone’s responsibility – students are expected to follow the Codes of Respect at all times and transition to their next class. Remind students to be at their best. Rise Ups – model for students by sitting with your advisory, listening attentively and modeling engagement. Be alert and aware of your advisory and support other advisors in maintaining student engagement. Walk through the plaza during lunch – become familiar with the community and how our students interact with it. Introduce yourself to employees and owners of businesses students frequent as a teacher at ARISE. Meet and greet Fruitvale Security Squad – add their phone number to your contacts. Social media can be a great way to connect with students and parents, however, exercise good judgment (consider your privacy and their privacy). * Be aware of the opportunities and challenges our students encounter daily. Subscribe to newsletters or updates from local organizations. Watch local news to be weary of events and opportunities that may affect students. Class cohesion is a departure from the concept of class management. Teachers should not be spending a lot of time regularly “managing” their class community. As such, class cohesion requires that your classroom intentionally develops the norms, systems, procedures, conditions, and culture of all members in the classroom. Classroom cohesion is what helps ensure that learning can happen, and allows us to build towards our mission and vision. As the teacher, you are responsible for making sure your classroom is a safe place where all students are supported, held to high expectations, and where learning is the focus. 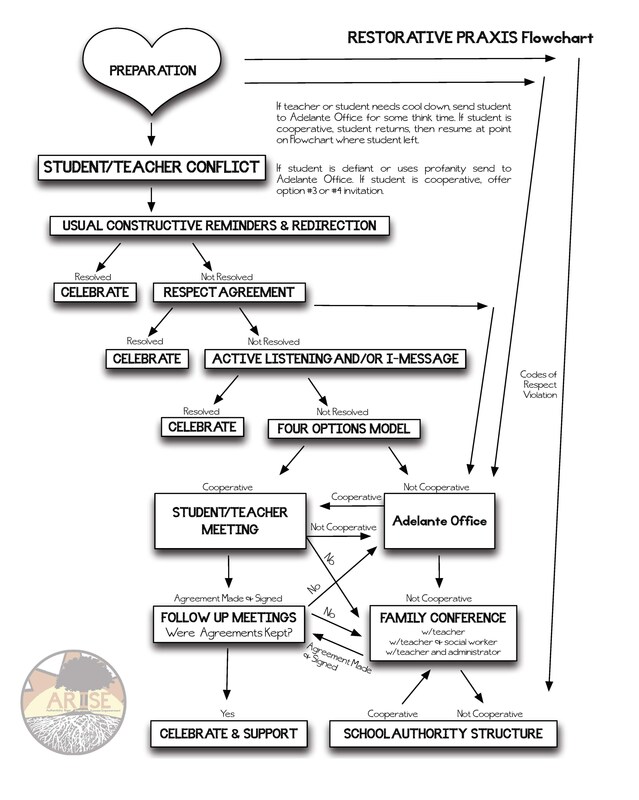 Most incidents/conflicts that occur within the classroom should be handled there. “Your work does matter more than you can imagine. Your students, particularly if they are low-income children of color, cannot succeed without you. You are their lifeline to a better future. If you put energy and expertise into your teaching, learn from those who know your students best, make strong demands, express care and concern, engage your students, and constantly ensure that your charges are capable of achieving, then you are creating for your students, as Professor Bill Trent once said about his own warm demander teacher, ‘a future we could not even imagine for ourselves’” (Delpit, 2012, 88). 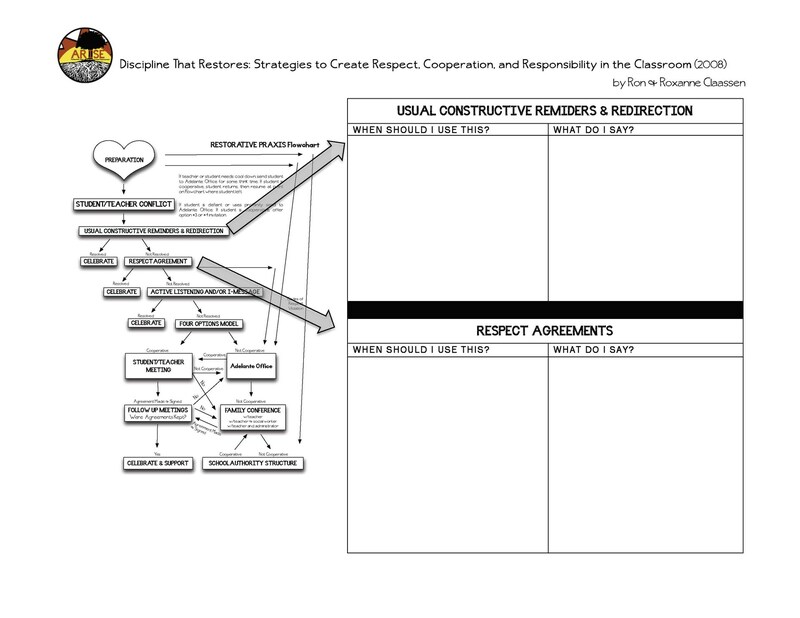 Discipline that Restores (DTR) understands that an implicit curriculum (Inlay, L., 2010) exists in schools. This social-curriculum at ARISE is centered on our Core Values, Respect, Persevere, Build, and Lead. We recognize that teachers teach more than just content, they teach who they are. With this in mind we understand that intentional preparation and culture production in our classrooms leads to increased community satisfaction, buy-in, and academic achievement. However, acknowledging the existence of this curriculum and the preparation needed to create healthy, loving, rigorous, and challenging classrooms and schools are two vastly different things. As such, over the years ARISE has been evolving its philosophy, systems, and structures to more clearly communicate what it means to Respect, Persevere, Build, and Lead. Grounded in the work of Keinfeld (1975), Ware (2006), Hollie (2011), Inlay (2010), and Claassen (2008), we’ve developed a multilayered system that explicitly recognizes our work as educators as culture producers. Core Values: Develop class norms based on these so students are clear about when they are upholding them and when they are not. Ground your discussions on culture and behavior in the Core Values. Prior Knowledge: Take time to become familiar with who is in their classroom. Pay attention to how they interact with the space, materials, and each other. What do students know? What are their experiences? Misconceptions? Student Voice: What do students care about? What do they think? ARISE’s vision to improve our own material and social conditions is the foundation for a Restorative Praxis (RP) program that trains our community to develop the agency and power to bring about change. A restorative approach to discipline shifts the paradigm of discipline from a focus on punishment to a focus “on responsibility, accountability, and a goal of restoration for all impacted by the offense” (Claassen, 2008, 6). This paradigm shifts is more aligned with the heart of the concept of discipline. Discipline, from the Latin, disciplina, meaning instruction, tasks us with the responsibility of not only changing behavior but also seeing it as an opportunity to challenge our community’s growth and development. At ARISE, rather than a “Discipline Policy”, a Restorative Praxis requires that all of us support a consistent practice rooted in the philosophy that we all need to be aligned in supporting our students and ourselves to develop the discipline to uphold these core values that we call the Warrior Intellectual Codes of Respect: Respect Self, Respect Others, Respect Your Word, Respect Space. School discipline is often reduced to a punitive system that has students pay consequences without the guidance to identify the root cause or develop a solution. 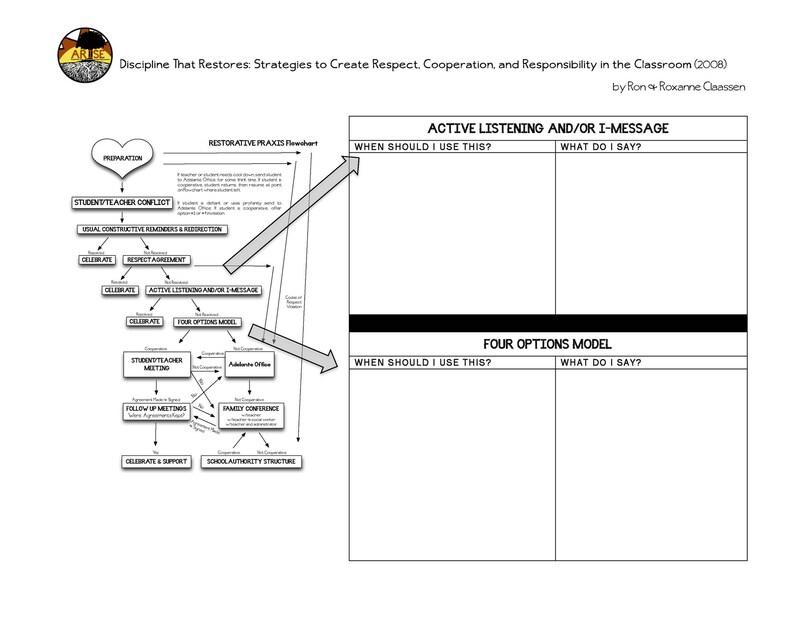 Our practice of Restorative Praxis not only addresses behaviors that violate our Codes of Respect but also pushes our entire school community to develop the tools to identify the root causes of behavior and how to build the capacity to make improvements. Through Restorative Praxis, we consistently say to students in unison that our Codes of Respect are valuable to us. Students will inevitably make mistakes and reflect a disconnect of understanding the Codes of Respect. It is our responsibility to consistently take those moments as teaching & learning moments. When we are inconsistent, students get confused. When students get confused, they do not necessarily know the boundaries. In a Restorative Praxis, there are clear school wide values and ways to uphold those values. There is also a clear set of actions that reflect a devaluing of those values. It is from this place where we must have consistent practices and consequences so that both students and educators know our commitment to establishing value of and in our space. In no way is a Restorative Praxis intended to dehumanize students and provide punishments. That is why learning, respect, culture, and consistency are at the center. A Culture Referral at ARISE is not a punishment. It is a consequence based on the principle that when a violation of the central values (i.e. Warrior Intellectual Codes of Respect) occurs, that there must be an educational & restorative process by which the person(s) who did the violation must go through in order to reflect and gain insight as to how to restore value in and of the space we call ARISE. A Culture Referral usually occurs after a number of behavioral interventions have been attempted following the Restorative Praxis Flowchart. In essence, a Culture Referral means that a teacher needs assistance from a school leader to mediate a process (with a teacher and/or another student) where the student can make amends for his/her behavior in a way that allows him/her to safely & productively return back to class. Culture Referrals can be filed via Google Drive. * These actions may still require that you seek help from a school leader, but you should get feedback first from Familia, the school counselor, and/or your academic department.